The latest edition of "Download of the Week" takes a look at what I think is one of the most important shows in DCI's history, the 1980 Santa Clara Vanguard. Seldom would a corps that placed seventh at the DCI World Championships be considered to have had a lasting impact on the development of drum corps, but SCV 1980 did just that. For this week only, the Audio Performance Download bundle featuring the 1980 top 12 finalists is available on the DCI Fan Network for a discounted price of $15.99 (regularly $19.99). The Video Performance Download of the 1980 Vanguard can be downloaded for just $3.99 (regularly $4.99). View all 1980 downloads. 1980 was a great year for drum corps. At the World Championships in Birmingham, Alabama's Legion Field, the top four corps were separated by less than a point. Blue Devils scored 90.60, followed by 27th Lancers (90.25), Bridgemen (90.05) and Spirit of Atlanta (89.80). Down five points to the Blue Devils was Santa Clara Vanguard, a corps that until that year had never been out of third place at the Championship. Of particular interest on the last day of competition was a tie for High Percussion. Five different corps shared the four high caption scores, the only time this has happened. 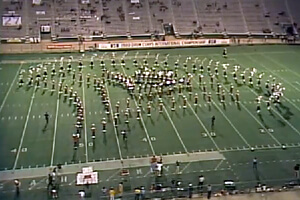 SCV's show is important to the history of drum corps because it was the first time that asymmetrical drill formations had appeared on the field to such a degree. While there had been asymmetry previously, the examples were still symmetrical drill that just wasn't symmetrical to the 50-yard line. Typically, this involved a rotation from an angle to the 50. That all changed, though, when DCI Hall of Fame member Pete Emmons decided to take drum corps where it hadn't yet been. After the opening Tchaikovsky fanfare, the corps blends into "Procession of the Nobles," which fans may remember performed this past season by the Cadets. During that first section, the corps rotated the form until it became symmetrical to the 50. During that period, lots of corps did huge static rotations, moving forms from one spot to another, rotating around a single "pick," a specific point on the field or in the form. Even in the drum solo of "Stone Ground Seven," which is written in the 7/8 time signature, SCV's forms were quite traditional. But the first glimpse that the drill form paradigm was shifting came at the end of the solo, when a circle rotated on a moving pick, ending in the formation of a star with the drums serving as the tail of a comet. 1980 Santa Clara Vanguard performance excerpt. Coming into the concert standstill of "Don't Cry for Me, Argentina" and "Buenos Aires" from "Evita," a fairly low-pitch asymmetrical arc of horns terminated with the drums continuing the arc by wrapping around a tighter arc. After seeing the show in Denver in late July, a friend sent me a letter proclaiming that part of the drill a shocking sight, comparing it to a man wearing a mustache on just one side of his face. Today, that drill formation seems so tame. For anyone who wasn't around during that era, it's difficult to explain how everyone reacted to that element of the show. In the closer of "Jupiter" from Gustav Holst's "The Planets," Emmons decided to make a statement and pushed the asymmetry much further. Five circles of brass players marched across the field in different directions as if planets floating through space. Then things got symmetrical again, but on a 45-degree angle. Next is what I considered at the time to be one of the most remarkably difficult drill maneuvers I'd ever witnessed: A wide open circle rotated to the side while the "pick" was moving, with the flags as rays of the sun (as if drawn by a child). Being that the circle had nothing preventing it from collapsing, this was a spectacularly challenging maneuver. Unfortunately, the majority of the audience didn't quite get the gist of what was happening, as is plainly heard (or rather, not heard) in the recording. It all developed so slowly that perhaps the fans didn't fully realize what just happened. Some felt the corps was beyond its time and couldn't make the judges sheets work for them, but there were other problems as well that were more quantifiable. Though the percussion section had won the drum trophy the past two seasons, in 1980, the line finished in eighth. And despite the innovation of the drill, the corps' M&M (Marching and Maneuvering) General Effect score tied for fourth place, 0.4 under the caption-winning 27th Lancers. One could say that 1980 set the stage for Santa Clara Vanguard the next year, as the corps came back to win it all in 1981. As for asymmetrical drill; it quickly became the standard and the drum corps activity never looked back. After the Vanguard took the plunge, the water was safe for everyone to enter. This week only, you can save on 1995 World Championship Audio and Video Performance Downloads on the DCI Fan Network. Buy the 1980 Santa Clara Vanguard Video Performance Download. (Available this week only for $3.99. Regular price: $4.99.) Buy the Audio Performance Download bundle of all 12 Finalists from 1980. (Available this week only for $15.99. Regular price: $19.99.) Offer ends Monday, Feb., 7 at 8:30 a.m. ET.